McCoy ("Cookie") had her first litter in mid-February. Dad is Frosty. They had three kittens. 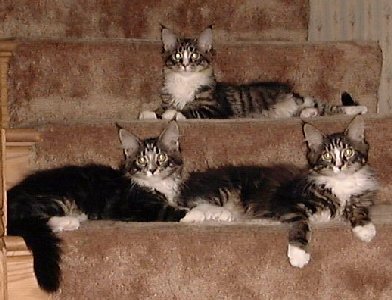 All are brown tabby and whites; because they have nearly identical markings, we've been calling them "the cookie-cutter kittens". "Snickerdoodle," a brown mackerel tabby and white female. 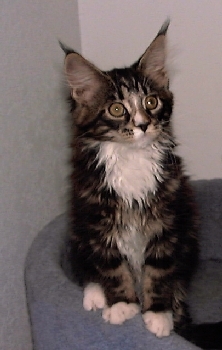 "Oreo", a brown classic tabby and white female. 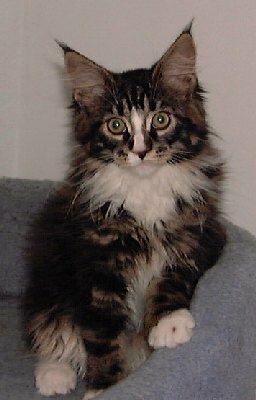 "Double Stuff," a brown classic tabby and white male who is quite a bit larger than his sisters. 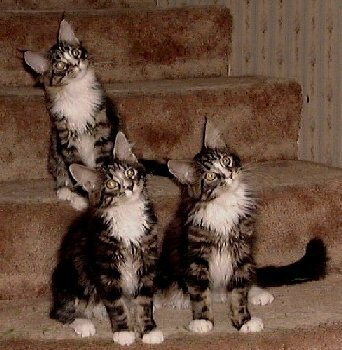 Here are all three kittens at twelve weeks of age. 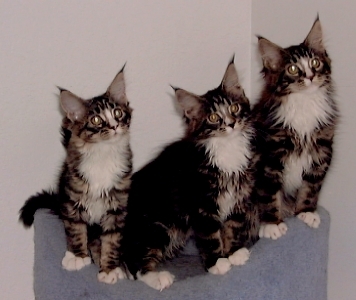 From left to right, they are Snickerdoodle, Oreo and Double Stuff. This is Double Stuff (affectionately known as "Stuffie"). He's a brown classic tabby and white male, friendly and affectionate. He purrs almost constantly, and plays almost nonstop -- with anything that moves, and many things that don't move. He loves to nibble toes, which forces us to wear shoes or slippers when we're around him. Despite being such an active little boy, he does love a good purring snuggle, though he knows better than to try to take someone's lap away from one of his sisters! Stuffie, now called Pinecoon's Rangerly Keegan, lives in Idaho with his sister Snickerdoodle (a.k.a Pinecoon's Juniper Acadia). 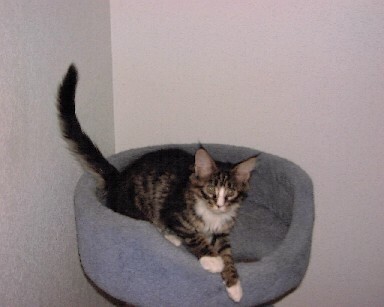 Oreo is a brown classic tabby and white female, very quiet and gentle. She isn't as rowdy as her two siblings, and will often stay out of the way as Snickerdoodle and Stuffie tussle wildly, pounce on each other from behind, and generally misbehave. Oreo prefers to sit quietly in someone's lap, purring contentedly and getting extra attention while everyone else is busy playing. She is initially cautious about strangers and loud noises, but doesn't take long to come out and investigate. Once she does, she usually ends up purring happily in the nearest lap. Oreo is now called Holly, and lives happily in Seattle. Snickerdoodle is a brown mackerel tabby and white female. She is a real tomboy and keeps up with her rowdy brother, pounce for pounce. In fact, she often gets the upper hand (paw?) since she is quicker and, apparently smarter than he is (or maybe she just cares more -- Stuffie is very laid-back about things.) Doodle, as our daughter Katie calls her, is very outgoing and affectionate, and purrs almost constantly. She wants to be in the middle of everything, and works very hard at being thoroughly in the way. Doodle, now called "Cady" (short for Pinecoon's Juniper Acadia), lives in Idaho with her brother.